On October 4th of this year Michigan celebrated a ‘first’ – the first French Canadian Heritage Day in the state. This came about after months of hard work on the part of volunteers whose interest and engagement with French Canadian culture was at different levels and came from many different perspectives. The result was a series of events across the state that drew on our shared cultural expressions, including food, music, history, and family. In July we began considering the “what next” part of a project with a milestone. And there was a general feeling that we wanted to transform our ‘ad-hoc committee’ into a more lasting organization. That feeling grew as our first milestone was achieved. We are now at a point of returning to that idea and raising the prospect with the many people who supported our campaign for a heritage day and for the hundreds of people who engaged with it on some level during the exciting lead-up to October 4th. To that end, we have formed the French Canadian Cultural Alliance of the Great Lakes. 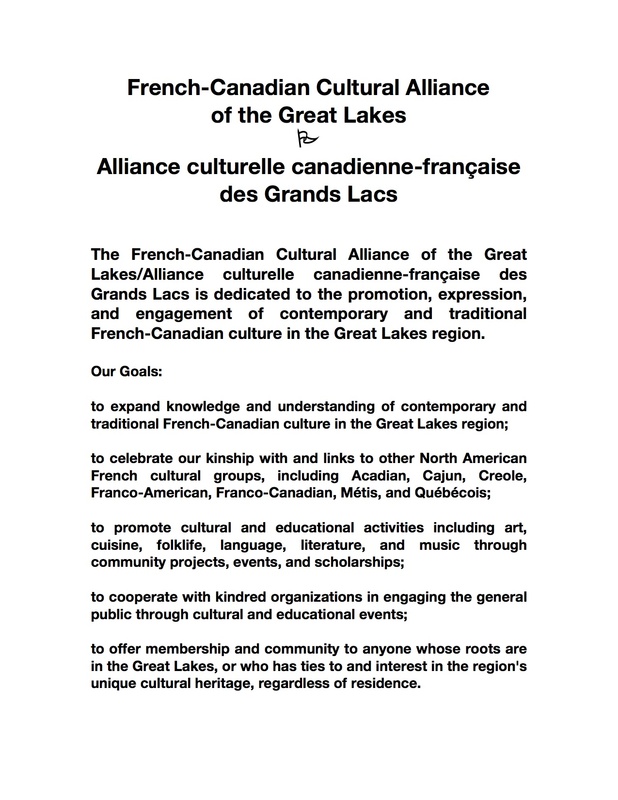 We are, for now, an informal, voluntary organization with the same dedication that we had for French Canadian Heritage Day: to increase awareness and involvement in French Canadian cultural life in the Great Lakes region. The Great Lakes French Canadians Facebook community forum with administrators Suzanne Beauregard, Jon Tremblay, and James LaForest. We seek to broaden the “French Canadian experience” of the Great Lakes to include all aspects of our heritage. While we understand that genealogy is an important part of this experience, and for many the only experience, we are not a genealogical organization per se. However, we certainly welcome those whose interests are primarily focused on that part of our heritage. Your participation in this new sense of community is not only welcome, but necessary. Without you, we don’t exist. In this modern world, it is easy to see that without an engaged community, cultural continuity and the continuity of traditional living becomes amorphous, perhaps even unimportant. For those of us who are working, writing, and living a French Canadian life, whether it be in a heritage center, on a blog, in the scholarly world, or through social activism, we seek to ensure the continuity of our culture by offering an avenue through which it can be lived, taught, and honored for many generations to come. I would like to help the group form. My research background is archaeology concentrating on French Colonial era especially in Detroit. I also have extensive experience in 501c3 group foundation and nonprofit fundraising in Michigan. I would also like to help with this group. I am the director of the St. Ignace Heritage Center, have a non-profit background as well as a grant writer. Our community is mostly French Canadian/Metis/Native American and many of the families here have lived here for several generations. Bonne jobbe, Jim! Je suis partant, mais tu déjà sais ça. I’m in! Look forward to working with a lot of great folks and helping English-only-speaking French Canadians learn their heritage language.